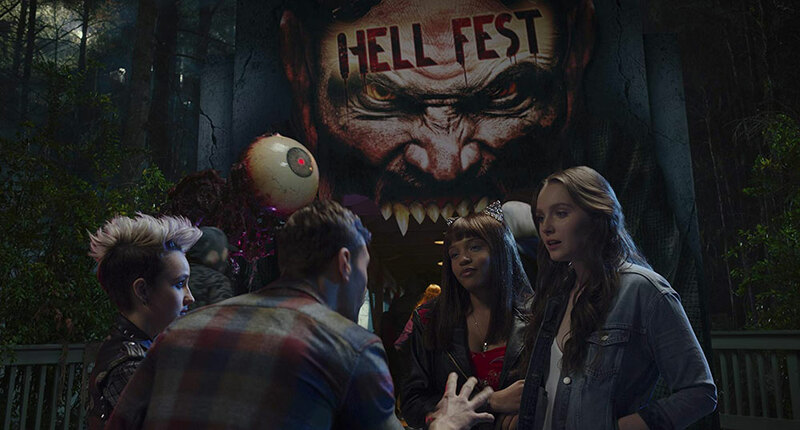 A slasher film that actually delivers on what it promises, “Hell Fest” is the perfect re-creation of everything that can go wrong in a haunted attraction. 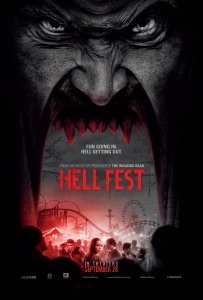 Horror films that take place in a centralized location is certainly not something new and is usually a trope that begins to tire quickly as victim after victim are knocked off as they run upstairs instead of out the front door, but Gregory Plotkin’s (Paranormal Activity: The Ghost Dimension) Hell Fest is a film I will readily make an exception for! While semantics can be argued that a horror themed park is not an enclosed location as you can move from attraction to attraction, this film manages to keep the atmosphere quite claustrophobic as the cast is relentless stalked and killed by a masked killer simply known as “The Other”. 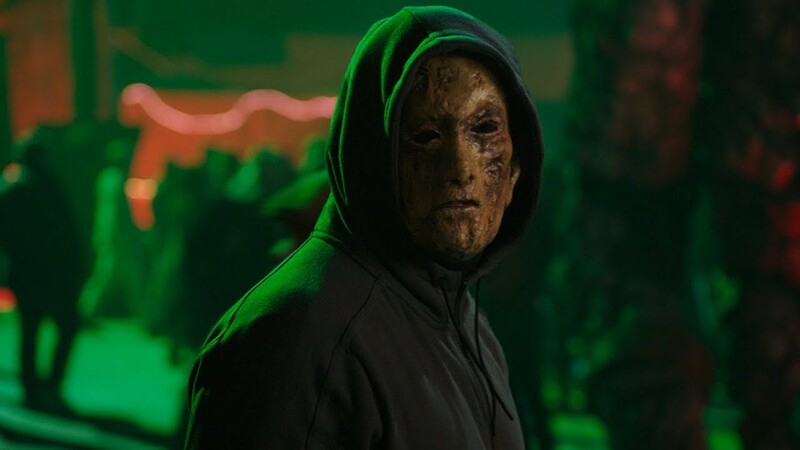 Similar in approach to many masked killers of the past, the killer’s identity is kept shrouded in darkness and mystery, raising all kinds of possibilities as to who it is and what the motivations of the deranged character could be. As with many slasher films the typical tropes are all on display in this film in full glory, but they never come across as an albatross to the production. All of the characters have traits that make you love and hate them at the same time which actually keeps you guessing who will make it to the end of the film. From a visual standpoint, there are several things that keep the film vibrant and rippling with a sense of dread and energy. The locations are stunning to say the least: you actually feel like you are entering a haunted attraction from the second the film starts. The colors are sharp and bright, helping to keep you as disoriented as the characters in the film. The camera work also keeps you in the zone as it frames the action precisely, never relenting as the killer extracts whatever psychotic and twisted desires they deem appropriate on the hapless victims. The sound design also meshes nicely with the visuals. The sound booms nicely in the park and especially in the haunted attractions. In fact, I would recommend going to a haunted attraction before viewing this film if you have never been to one. The emulation of the environment is spot on. 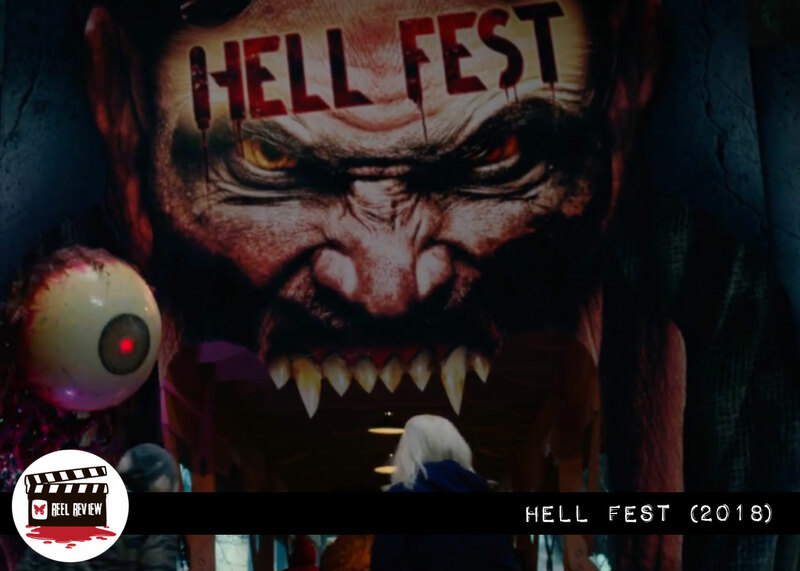 Many times the art department is a forgotten aspect of horror films, but in Hell Fest they are really the main stars of this film. In addition to the great look and feel of the various stopping points in the attractions, the look and design of the different locations are certainly their own characters. Whether you pay attention to the props or the actual costumes of the assorted horror themed characters in the park, there is a certain attention to detail that the average amateur just can’t emulate. Many of the costumes and make-up are affectionately done with even the minutest detail highlighted. As an FX artist myself, I cannot begin to imagine the amount of time that went into preparation and the actual application of the make-up. The lighting department also deserves a special nod here as well. The key element to any haunted attraction is how much you allow the visitors to see and they managed to re-create that look while still allowing you as a viewer to see just enough of what is going on to keep you drawn in to action. Going hand in hand with the art department is the FX department as well, and they deliver pretty well here. While I am sure that there will be an uncut version of the film upon its home release, they manage to get away with a decent amount for a theatrical horror film release. 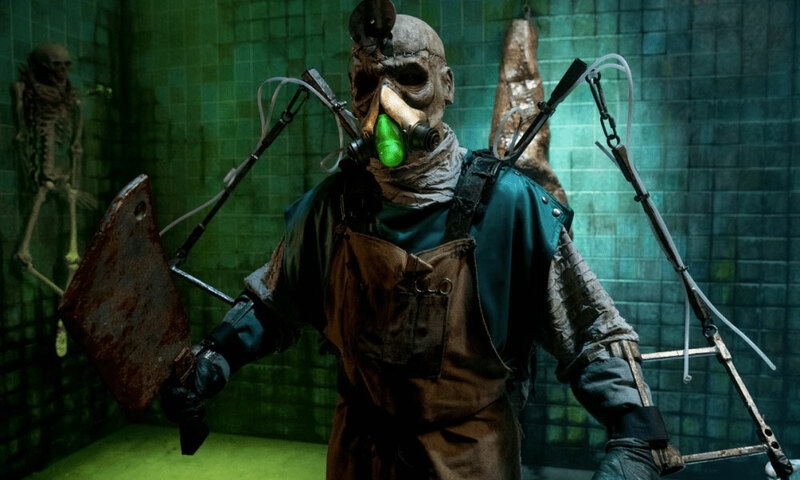 Stabbings, slashing, eyeball penetration and bludgeoning are but a few of the gruesome things you will get to experience as “The Other” makes his rounds during the film. There are certain homages to genre films of years past (Texas Chainsaw Massacre comes to mind out the gate, but not for the reasons you may think) but it never comes across as a copycat and manages to show things in a new and refreshing ways. Never quite the absolute gorefest you may think it is going to be, the FX crew certainly gives you the sizzle with the steak without actually rubbing your face into it to the point it becomes revolting or unwatchable. 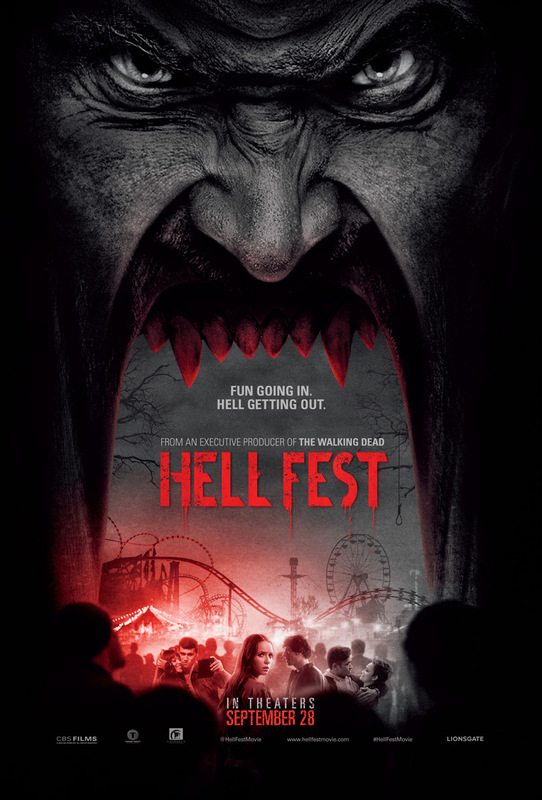 Hell Fest is well done to the point that you think you see more than you actually do. The cast is quite capable, and I was pleasantly surprised by seeing Tony Todd in the film. The actors and actresses never seemed to be awkward or out of place with one another (which is often the case in genre fare like this), nor does the dialogue ever seem out of place with character actions. The script comes off as believable and never tries to over explain itself, which to me leads to fun speculation and the possibilities of future sequels and prequels. Some may argue that it was unrealistic to have murders going on in a haunted attraction like this, especially in certain scenes where parts of the main cast find themselves isolated from the masses, but if you actually pay attention to the specific scenarios that they wind up in, everything actually becomes quite plausible. Some may take umbrage with the ending as well, but I feel that the interesting “twist” sets the story up for a rich backstory at some point and offers something interesting for what I am sure will be at a least a sequel or two. Very nice to see a hard R rated film in a time when PG-13 horror is becoming more and more the norm in Hollywood releases!